Tom Dixon always creates magic and makes unique product. This time he creates a classic and sensational design to his new product. The ‘ Beat Light’, the sensational light that not only reflects the beauty of the light and the class but also it is one of the most iconic products in the collection, inspired by the sculptural simplicity of brass cooking pots and traditional water vessels on the subcontinent. This pendant light is spun and hand-beaten by renowned skilled craftsman of Moradabad in Northern India. 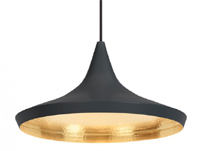 The Beat Light is made from brass with a black patinated exterior. The Beat Collection also includes Fat, Tall and Stout and comes in white, grey, and brushed brass. It is compatible with Megaman LED 3W Light Bulb. It also creates a dramatic statement if hung in multiples with different shapes. One can create a different loom with the pendant system. This look will be classier. The light can create a perfect harmonious ambience in a living area, dining or lounge area.